The Mi'kmaq-Wolastoqey Centre at UNB Fredericton will host a celebration of National Aboriginal Day on Tuesday, June 21 from 10 a.m. to 3 p.m. that will include a panel session on reconciliation efforts in the province. The morning program will include artists, song and dance, and storytelling, featuring Gilbert Sewell. Mr. Sewell has won several awards for his dedication to sharing, expressing and teaching others about Mi’kmaq culture including the NB Human Rights Award, The NB Eco Award, Orono, Maine Museum Award and the Canadian Merit Award. There will be a lunch provided at noon, which will include traditional dishes and treats, as well as coffee, tea and beverages. The afternoon portion will showcase the panel, beginning at 12:30 p.m. Language revival, reconciliation framework, and historical and contemporary contributions will be discussed. Panellists include Stephen Dutcher, president of Mahsos Education and Research Associates and David Perley, Mi'kmaq-Wolastoqey Centre director. The day will conclude with a traditional closing ceremony. Wabanaki artisans will be displaying their work during the day. 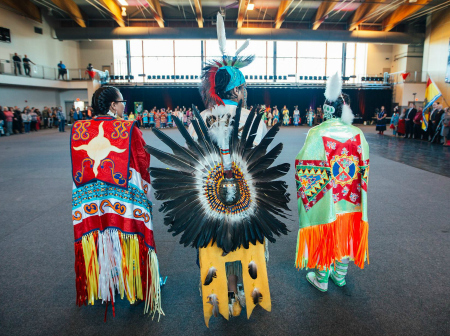 This is the first campus celebration of National Aboriginal Day; admission is free and everyone is welcome. The celebration will be held at room 143, Marshall d’Avray Hall, 10 MacKay Dr.